Just before the holidays, we received a package from some of our favorite ladies over at Gourmet Attitude. It was an intoxicating Black Winter Truffle and kind of the best holiday gift ever. We had just enough time to play around with a couple recipes before leaving for Christmas. 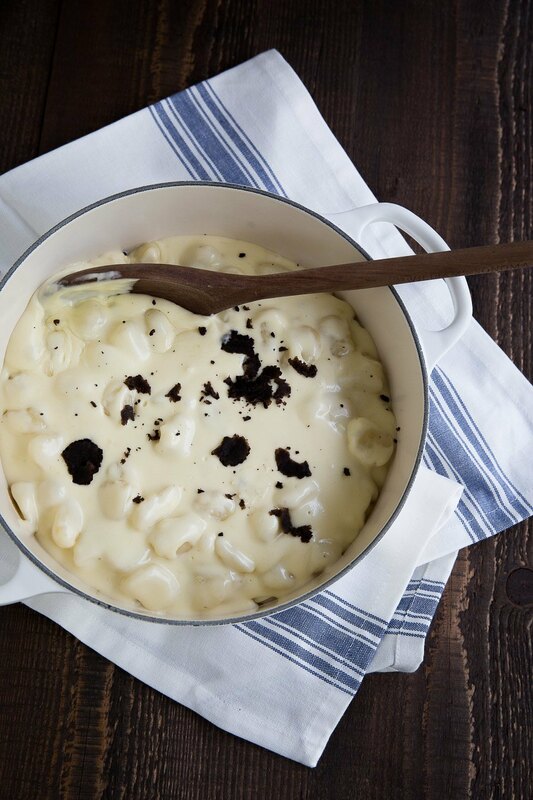 Our favorite was this recipe for Truffle Gnocchi Mac and Cheese. We almost felt like we were cheating on the truffle, by not giving it more of a grand fare recipe but then after making it a few more times, we decided that simplicity and a gorgeous black winter truffle were perfect together. Whenever we mention to friends that we have received a fresh truffle, and who like to enjoy it with us, they immediately think “fancy.” Much to their surprise, this time, it was a recipe for comfort food. This recipe comes together in a flash and can be served either creamy or baked. It really is the best of both worlds! The flavor of the cheeses, sliced winter truffle and garlic reminded us of a rich fondue; gooey, earthy and slightly garlicky. Served with a full-bodied red wine, along with a simple green salad and you have the perfect winter meal. Black Winter Truffles are in season now and should be enjoyed. We always turn to Gourmet Attitude for the best fresh truffles as well as truffle products available. Besides being spoiled with fresh truffles, we also love their truffle honey; outstanding with a creamy Roquefort cheese. As well, we enjoy their La Tartufata (white truffle cream) tossed with fresh pasta and a dollop of butter, it is sinful. And our favorite balsamic vinegar, hands down is the one they sell in their shop. It is rich and creamy with the perfect acidity balance; lovely drizzled over a simple arugula salad or even a wood-fired pizza. Happy Truffle Season! Thank you to Gourmet Attitude for sending us this gorgeous black truffle to enjoy! Bring a big pot of salted water to boil. Cook the gnocchi for 2 minutes. Drain in a colander. Then drizzle with some olive oil and set aside – this helps prevent sticking. Rinse out the same pot. Melt the butter over low heat, add the garlic, stir and cook for 3 minutes. Over very low heat, whisk the flour into the butter/garlic mixture to form a paste. Slowly drizzle in the heavy cream and continue whisking until smooth over very low heat. 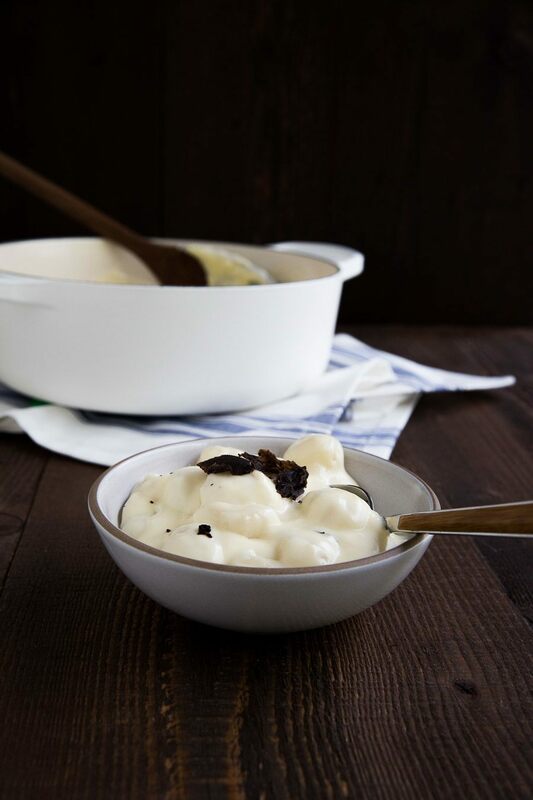 Stir in 2 tablespoons finely minced black winter truffle. Continue stirring until slightly thickened; about 3 – 5 minutes. Stir in the cheeses until smooth. Remove from the heat and fold in the gnocchi. Serve with more shaved truffle as garnish. 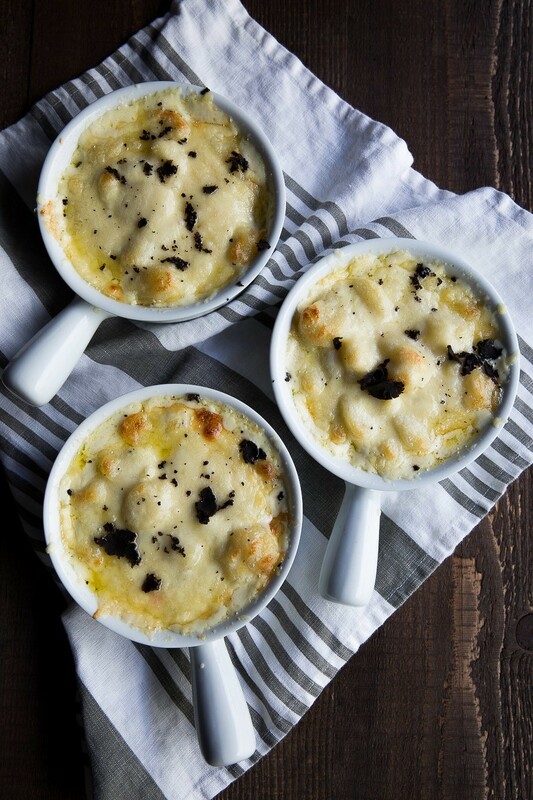 ** if you want to bake the creamy gnocchi, divide the mixture between 4 small baking dishes. Sprinkle the tops with a mixture of both kinds of cheese (grated), then bake at 350 for 20 – 25 minutes; until lightly golden and bubbly. 7 Responses to "Truffle Gnocchi Mac and Cheese"
That looks so incredibly delicious and the ultimate comfort food for a cold and rainy night! Any night really! I hope all is well and that your new year is off to a good start! Hard to believe it was almost a year ago we had our food photography session! Time flies! That looks so good! I've never bought truffle, oddly enough. I should check where I can buy them from here. That would be a great gift idea Lisa, and they are so good in pasta dishes or even with simple scrambled eggs. Definitely Joy, you should check them out. Check with Gourmet Attitude they may be able to ship to Canada - they supply to a lot of restaurants so you never know! Dear Lord I need this truffle mac and cheese in my life. If I lived closer, I would be camping out at your house! !